THEIR name is no mere hype. When MB&F called a series of its timepieces as Legacy Machines, the watchmaker was merely stating a fact; each of these watches is a genuine example of wrist engineering. Simply put, Legacy Machines are modern reinterpretations of significant works in horologic history. Legacy Machine No.2 (or LM2, for brevity) props up this argument excellently. 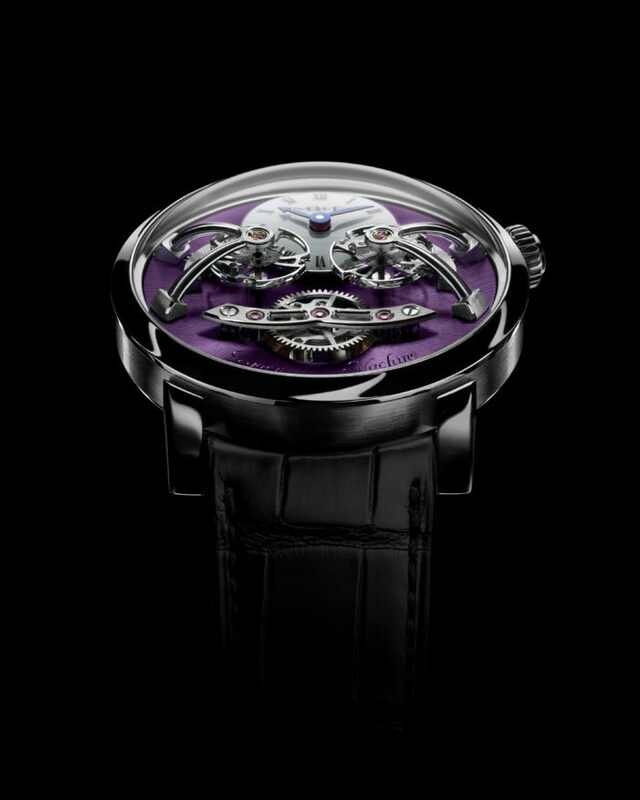 This watch features two “flying” balances, each one suspended above the dial by means of four gracefully arcing arms. While the execution is unmistakably contemporary, the technology is actually steeped in haute horlogerie tradition stretching more than 250 years back. Think of the creations of Abraham-Louis Breguet, Ferdinand Berthoud and Antide Janvier — these are the men from whom MB&F took its cues. 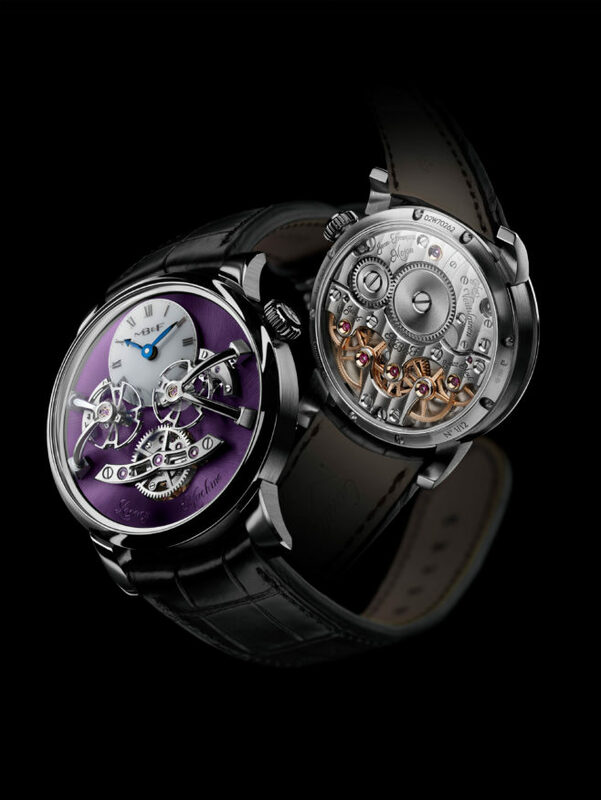 MB&F debuted the LM2 in 2013. The watch came in 18-karat red gold, 18-karat white gold, and a limited-edition run of 18 pieces made from platinum. The redesigned piece from 2017, also limited to 18 examples, came in titanium. 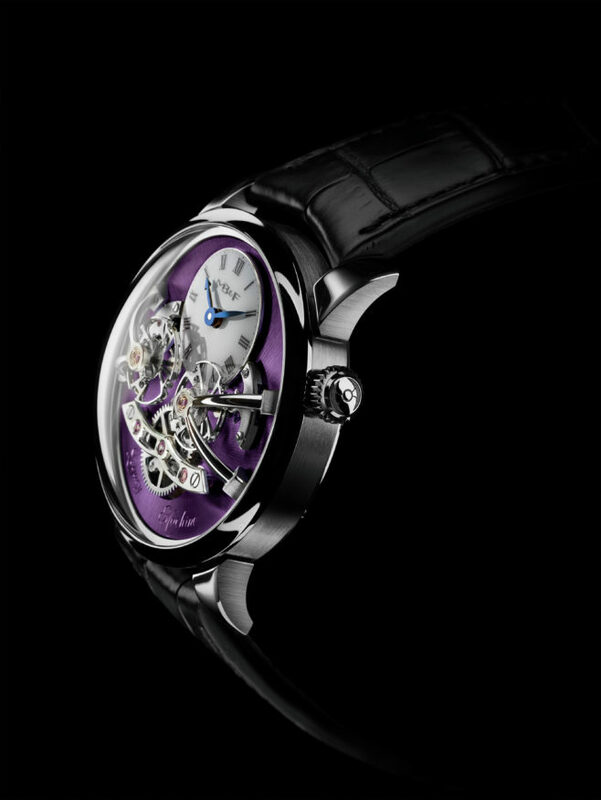 Now, the LM2 returns in an 18-karat white gold, 44-millimeter case, but which gets a new dial treatment in purple. This new one is limited to only 12 pieces. 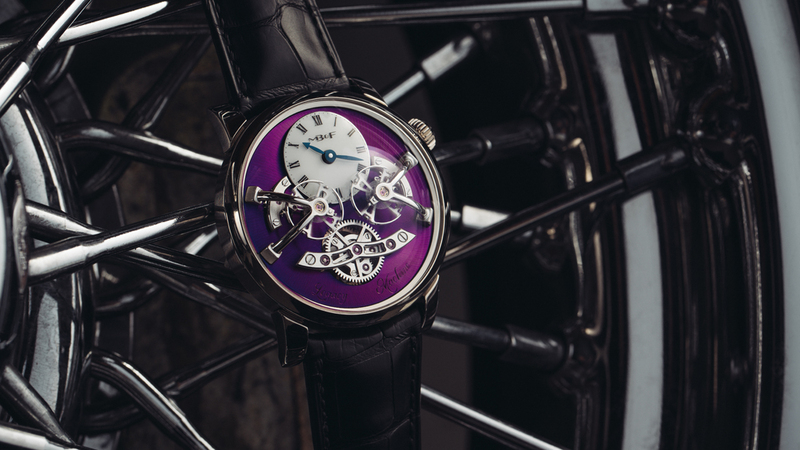 Suitably called LM2 White Gold Purple (see, MB&F really calls it as it is), the watch comes fitted with the sleeker balance bridges of last year’s titanium pieces. 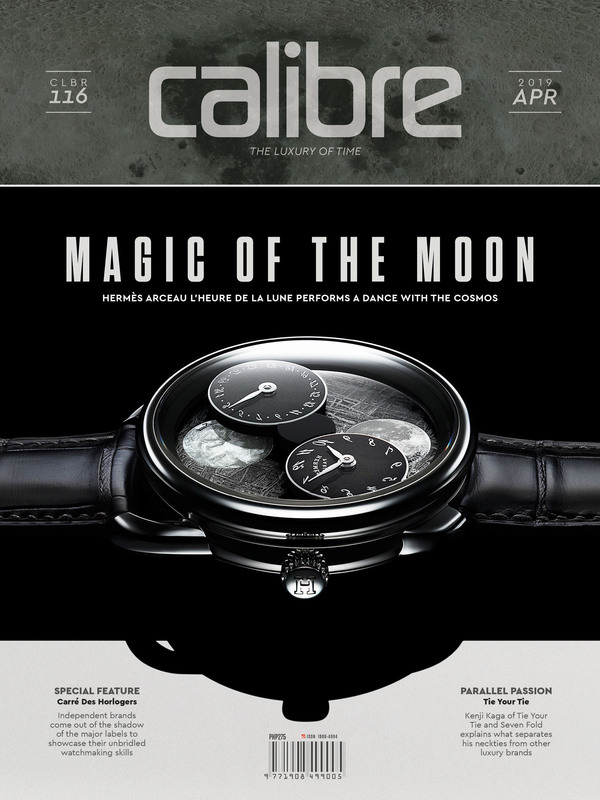 But further making it more elegant than any previous LM2 rendition is its sunray-finished dial whose purple hue — all right, it may seem bluish or even reddish in certain light — was the result of chemical vapor deposition, a high-tech process that evenly coats a surface while allowing it a multi-faceted color. This explains the new LM2 dial’s ability to subtly change hues depending on conditions. Actually, the dial is the top plate of the movement itself. This handwound, 44-jewel movement was developed by Jean-Francois Mojon and Kari Voutilainen, who looked after its aesthetics and 19th-century-inspired hand-finishing. The result is that Geneva waves, gold chatons, mirror-polished bevels and bridges mix it up with true micro-engineering prowess. The movement’s two balance mechanisms call to mind the dual regulator watches and clocks of Messrs. Breguet, Berthoud and Janvier. Working on the phenomenon of resonance — in which one oscillating body somehow influences the rate of another oscillating body nearby — the LM2’s movement is able to average the rate of the two balances. Where it differs from most dual regulator timepieces is that the rates of the two balances are transmitted to a single gear train, rather than to two separate movements. This is as tricky as it sounds. A large planetary differential, also sitting prominently on the dial, is key to this act. The differential transfers power to each of the regulators, receives the individual timing rates from each balance, and then sends the average rate of the two regulators to the gear train — which finally spins the hands to display the time. Oh, and what a display it is. An unadorned white-lacquer subdial at 12 o’clock, with its blued gold hour and minute hands, as well as Roman numerals, is flanked by the two flying balances whose supports are mirror-image mounted on either side. Below the subdial, also placed in between the balances, is the large differential at 6 o’clock. Make no mistake, it’s a tidy yet stunning rendition of a thoroughly complicated watch that deserves every bit of purple prose lavished on it.